From local street vendor delicacies to haute cuisine, Taipei eating culture is never a questionable subject for its drooling gastronomy with authenticity from various heritage aspects. By gathering the local’s best and being able to transcend into nouvelle presentation but not forgetting the authenticity, YEN Chinese Restaurant in W Hotel Taipei has redefined the dining scene in Taipei not only for the locals but patrons who travel the globe that appreciate such treats and twists. mylifestylenews writes. The stunning purple color is the highlight and touches in YEN Chinese restaurant, hence wise the wow factor is expected in its modern, chic and contemporary interior. With a high ceiling and floor level’s window located at level 31, this bold top floor restaurant of W Taipei allows you to enjoy the city’s best view of the valley of Taipei as well as the 101 Taipei that is just blocks away. 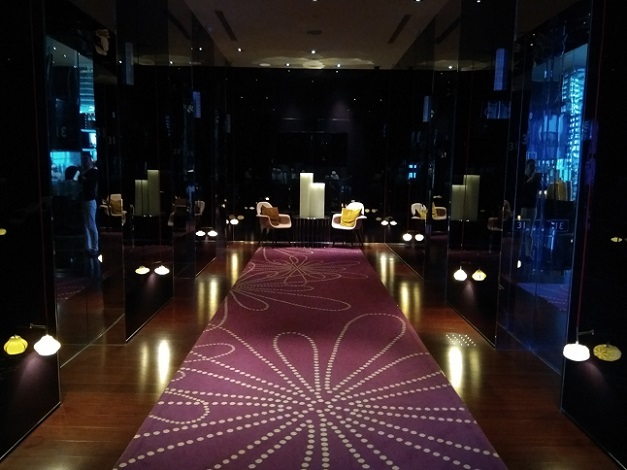 When you step out of the lift, a soft purple carpet will lead you to the restaurant entrance with stylish designed and hanging lamps awaiting your arrival. The spacious open kitchen is well designed and equipped to cater for the classic Chinese kitchen style of culinary needs, from the steam section, deep fried and wok fried section to the oven roasted department, all of which are are well laid out. With the new Executive Chef Wo Hoi Ming on board, YEN even takes you further from its already infamous menu to redefine the contemporary Chinese cuisine in Taipei. Chef Ho’s Michelin-starred culinary experiences from Japan and his homeland in Hong Kong has created some “nouvelle Cantonese cuisine” menu by marrying the Chinese gastronomy with an innovative presentation. His many signature dishes from his ‘Wow-Tastic” menu are no strangers to Cantonese food aficionados. We went for the <Work Hard, Play Hard> Lunch Set Menu III which is a 7-course tasting menu that is full on in terms of quantity and value, that is one of the best ways to sample most of Chef’s Ho signature creations all at once. Indeed, the menu has already “warned’ you, work hard, play hard and yet we eat hard to enjoy from the beginning to the end. 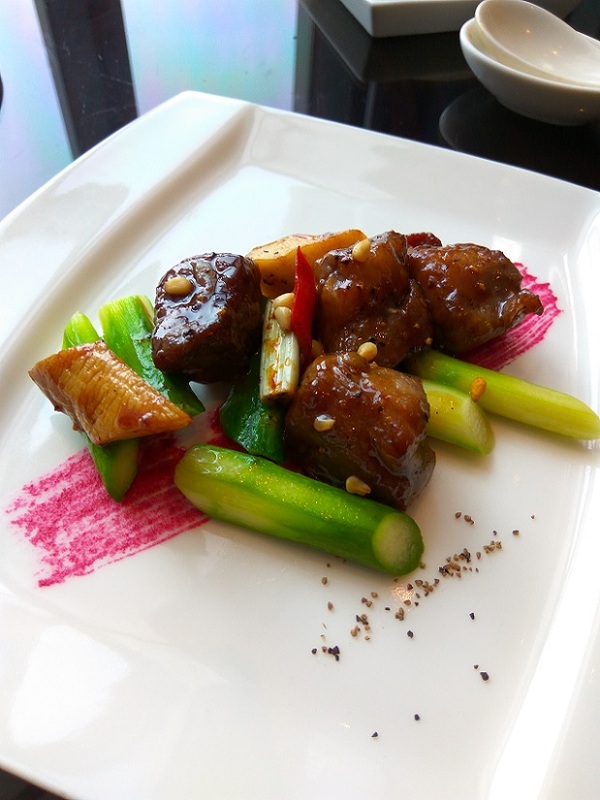 This one-mouth bite size consists four classic Cantonese & Shanghainese starters that were perfectly garnished with the accompanied ingredients such as the edible flowers and presented on a black ceramic plate to highlight the colors of the palatable dishes. There is no particular sequence to enjoy this combination but to go with your own likings. The thin crispy suckling pig skin is best to enjoy with a light dip in the mustard sauce and to finish by cleaning your palate with the cucumber. The skin of the Cherry tomato with Osmanthus flower is a cold dish, a sweet and sour combination to whet your appetite before other meat dishes follow. The Cantonese style rose golden chicken with scallions is another savory that will warm your appetite, with the scallions marinated with oil and ginger which is often salty but quite normal to bring out the best taste of the chicken with such a combination. We reserved the classic Shanghainese’s four treasure soy wheat bran for last for its cold and airy texture by washing away the heavy palate from the chicken. Seaweed is never our priority but has now become a trend especially in soup preparation. The presentation may look more than just a salty lake stuffed with seaweed in still water but somehow we can judge the book by its cover. This light broth is tasty and the fresh crab meat added value and essence to the soup but with the rather slimey seaweed on palate not exactly something we enjoyed, but some like it that way. Enjoy while it is warm. Simply fresh and light, In a Cantonese restaurant, fish is best steamed in order to enjoy the freshest of its flesh with a light steam fish soy sauce with a hint of sweetness to enhance all steam fish dishes. Thumbs up for this creation and once again it is proven simplicity at its best! Unless otherwise stated, all the beef items they use in YEN are choice grade U.S. beef but our Australia beef short ribs is another divine creation. The beef short ribs are diced into cubes for easy enjoyment and stir-fried to perfection. Each bite melts into your mouth and the well blanched asparagus balances up the black pepper sauce just as well. You can’t not have any Dim Sum dishes especially when you are lunching in a Cantonese restaurant. With 28 years culinary experience, Chef Wo is certainly not forgetting that to insert in his menu creation. The Dim Sum trio consists of the must-have Har-Gao (steam prawn dumpling) which is divine and the mini abalone Siu Mai (steam pork & shrimp dumpling) that never disappoint as well as the steam chive dumpling with grounded peanuts and pork. Mango Sago with Pomelo in coconut milk is the dessert that everyone craves for in a Cantonese restaurant. A harmony and combination ingredients are used, and this soup base dessert can be served either warm or cold. A must try and well-like dessert for all ages. Seasonal fresh fruit platter serves watermelon, pineapple, kiwi fruit and a grape to complete the meal. When you finish your meals in YEN, it doesn’t mean that you would leave at once for not visiting the chic and stylish YEN Bar which is at the other end corner of the restaurant. This beautifully decorated bar has one of Taipei’s most extensive and innovative cocktail lists as well as 80 kinds of whisky and 100 kinds of wine for your preference. Afternoon-tea is popular here too to stay through the evening while watching the world go by. Sunset is expected here to end your day while sipping one of the best cocktails in town by toasting the bright Xinyi district lights of sprawling Taipei skyline. Service is worth mentioning here as staff are quite attentive and always ready to cater for your needs. 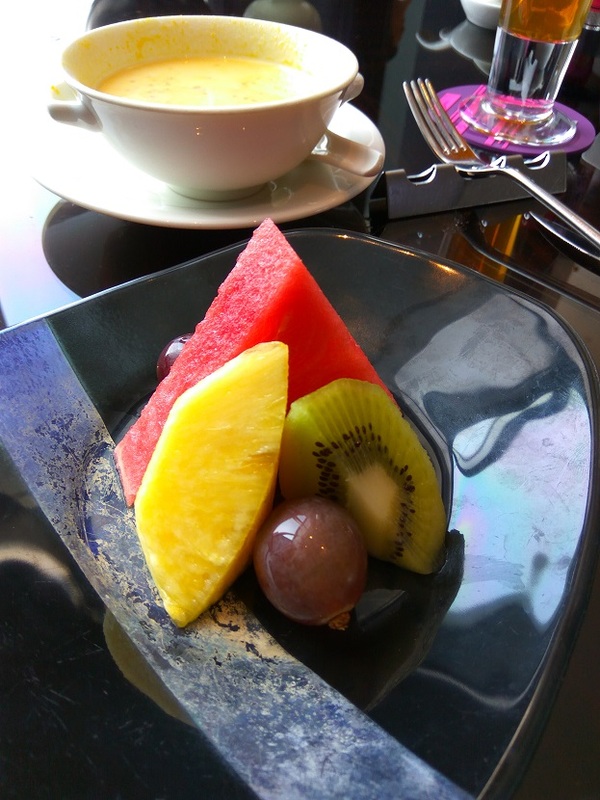 YEN Chinese restaurant not only elevates the Cantonese cuisine in Taipei to the next glamorous level, but also offers you a visually sensational experience.